Franz Penzoldt, originally from Thüringen, came to Erlangen in 1874, completed his habilitation in 1875 and quickly became a leader in paediatrics. In recognition of his achievements, he was made a professor. In 1893, he became head of the institute of pharmacology and its outpatient department. During his time in this role, he played an important part in the establishment of what is now the Department of Paediatrics and Adolescent Medicine. From 1903 onwards he was head of the Department of Medicine in Erlangen. 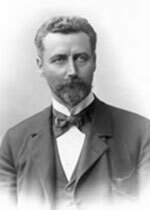 Franz Penzoldt also worked to help children outside of the University. In 1887, he helped to establish one of the first milk banks in Germany. During the First World War – as a military doctor – he led the military hospital which was housed in the university buildings. He was made an honorary citizen of Erlangen for his services to the city. He received recognition in the form of an honorary doctorate from the Faculty of Humanities, Social Sciences, and Theology.